Lynn Marie Hulsman, an American author, has penned a heart-touching, warm, and summery love story called, Summer at Castle Stone that revolves around a recently fired big apple girl who takes a leap to ghost write a book for a world famous chef in an old countryside village in Ireland, so that she can make her own name devoid of her father's celebrity status. Shayla Sheridan, a typical New Yorker, daughter of a celebrity writer, bags a job as a co-writer to a celebrity chef, Tom O’Grady. 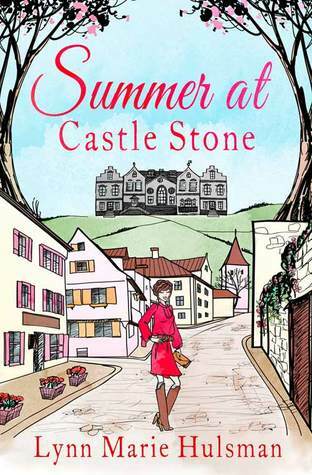 Unfortunately, Tom doesn't allow Shayla to co-write his book, and that is when Shayla's best friend, Maggie, fabricates a plan to get Shayla to Ireland's old countryside cottage in Castle Stone, where Tom works as a head chef, by changing her friend's name to Sheila along with fake work experience. Will Tom's Irish charm make her fall for him? Will she be successful in making a name under false pretense? This is not the first book that I'm reading of this author. Her debut book, Thornton Hall equally enthralled me like it did me this time. I'm a huge fan of the writing style of this author as she pens her story with some Irish flair laced with funny anecdotes, emotions and lightness. The narrative is engaging and witty as the primary character explores Irish delicacies and recipes under a false identity. The readers are bound to feel an immediate connection with this story as the author has explained everything with enough details. The pacing is really swift as the story progresses with Shayla, a.k.a, Sheila's journey into Irish cooking world alongside with the head chef. The only thing that kept me going through the story was the vibrant cast of funny, crazy and interesting characters, although their drama went on for a very long time. The myriad characters cracked me up with their craziness and some warmed me up with their cuteness and some simply made me hate them. The primary character, Shayla is a motivating as well as a sweet woman, who falls for her best friend's idea to adorn a false identity. The motivating part about her is that she wants to make her own name and does not want to live under her father's celebrity identity. The supporting characters are also quite well-developed as they leave a lasting impression on the minds of the readers even after the end of this story. The author has captured the Irish atmosphere into her story line quite flawlessly. Not only that, the author has arrested the Irish traditional recipes, the culture as well as the linguistic changes vividly alongside the picturesque countryside mesmerizing backdrop. And with a passionate romance, this story is a must read for your next summer read. Verdict: Captivating light read, summery and Irish love story that will make you go weak in the knees! Courtesy: Thanks to the author, Lynn Marie Hulsman, for giving me an opportunity to read and review this book. How did you come to be one, you ask? My mother died. Yes, yes, very sad, thank you for your condolences. With that came an epiphany. “Life is short,” said my inner voice. “Thanks, I.V.,” I replied. “I know what I have to do. And in two and a half years, I’ve gotten an agent, co-written two books, ghost-written another, published an article, completed one novel, and started a second one.